A new summer advertising campaign for beef products by UK retailer Marks and Spencer has taken product traceability that step further. 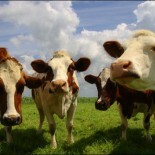 M&S is the only UK retailer to embrace DNA traceability for its beef – from steaks to burgers. Traditional track and trace systems have provided the highest level of transparency about product by being able to trace product to batches and even farm. However, IdentiGen’s system uses DNA analysis has become the next step in providing retailers and processors with assurances about origin and product claims. According to IdentiGen, which was founded in 1996 as a spin-out from research conducted at Trinity College, Dublin: “By tracing the DNA in meat and linking it to the original animal and its production history, DNA TraceBack enables grocers and meat processors to source with integrity. This advanced level of supply chain transparency helps verify product claims, and can be used to market retail and meat brands with greater confidence to consumers. The company adds: “DNA TraceBack helps simplify the complexity of continuous quality improvement. It gives meat producers a tool to verify the source and genetic background of live animals procured, and provides retailers and meat processors with vital supply chain insights which can be used to identify, enhance, and standardize the production of high-quality meat products. “DNA TraceBack enables retailers and processors to accurately identify production batches and monitor the flow of raw materials throughout large grinding operations. Marks and Spencer’s summer-long food marketing campaign shines a spotlight on the retailer’s beef traceability standards. As highlighted in the campaign, M&S is the only national retailer in the UK that can trace every piece of beef it sells – whether it is in a prepared meal, a sandwich or a prime cut – all the way back to every farm and animal from which it is sourced. For the traceability to be robust, thousands of tests are carried out every year to check that M&S’ standards are being followed. Sharry Cramond, Food Marketing Director at M&S, said: “Since joining M&S I’ve been amazed at the stories behind our products. “Our people go to extraordinary lengths to source the very best ingredients and products and we are not shy of using cutting-edge technology to guarantee our provenance. M&S uses DNA sampling to trace its beef back to every farm and animal. A sample is taken from every animal from every farm that supplies M&S and its suppliers. Thousands of tests are carried out every year on products taken at random from M&S stores and warehouses. The tests check that beef is moving through the supply chain – from farm, to abattoir to processor and to store – correctly and that M&S standards are being followed. Steve McLean, Head of Agriculture at Marks & Spencer, said: “We’re passionate about supporting British farming and working with our suppliers to invest in new technology and the best systems available. This entry was posted on June 12, 2018 by agedchrisharris in Cattle, Meat, Uncategorized and tagged Beef, companies, DNA, food, Health, Supermarkets, traceability, trade.